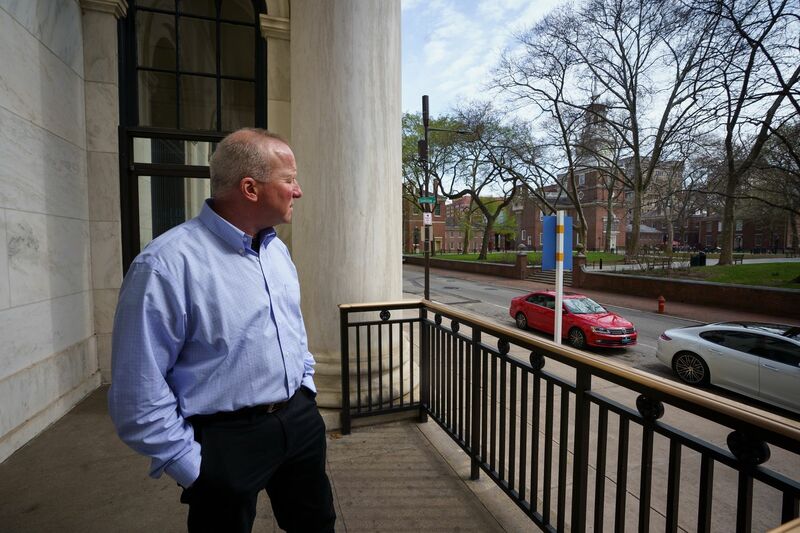 Ken Sher outside his apartment in the Curtis Building, near the Independence Hall clock tower and traffic, which contribute to noise in Philadelphia. During the 25 years Ken Sher and his wife, Nancy, lived in a house in Doylestown, their main noise concern was a neighbor’s barking dogs. So they were understandably nervous about moving into Philadelphia, an inherently noisier place. “My wife ruled out places based on the volume of traffic on the street, and we would go and sit on a bench for a while and just listen, or talk to people who lived in the area,” said Ken, 58, an executive and career coach. The couple moved to Washington Square last August. They bought a white noise machine to help drown out the sound of delivery and trash trucks, which helps a lot, Ken said. Noisy traffic, including cars, buses and delivery trucks, are a reality in big cities. Some residents invest in white noise machines to cancel out the sounds. A construction boom and increased popularity in city living has made noise more of a factor in house-hunting in Philadelphia. More trucks, buses, trains, cars, and sirens contribute to outside noises, but indoor noise is also a factor. Warehouse conversion spaces in places such as Fishtown and Kensington have created more multiple-family living, and apartments and condos can have thin walls and ceilings. Dean has embarked on a personal quest to test city noise levels with a decibel sound reader. “I work with a lot of empty nesters who are coming from the suburbs and may not think that noise is a factor,” he said. Traffic noise is just something that’s hard to get around in a city, said Robert Tanen, senior consultant at Metropolitan Acoustics consulting firm in Center City. But there are certain protections for homeowners in terms of allowable sound levels, he said. They should research the building’s construction, and building rules or lease language that refer to noise. Noise studies generally measure two kinds of sounds: sound transmission class (STC), which refers to airborne sounds, such as someone listening to the Eagles game with full surround sound in the condo below you, and impact insolation class (IIC), which is more about vibration-induced sounds, such as footsteps on hardwood floors or moving furniture. The international building code requires an STC and IIC of 50 in design, but the higher the number, the better. When you’re looking at a neighborhood, actually take time to stop and listen, Tanen suggested. In Washington Square, the Shers initially had to adjust to the hourly clock chime from Independence Hall but now don’t even notice it. “It goes off every hour on the hour, 24 hours a day. But it would be pretty presumptuous of me to go over and say, ‘I know this bell’s been ringing for 250 years or so, but would you mind turning it off between 11 p.m. and 6 a.m.? '” Ken said with a laugh. Exempt from Philadelphia’s noise code are sounds “lasting no more than 5 minutes in any one hour” created by bells, chimes, or electronic devices used for religious or education purposes, or to tell time. But sounds caused by activities such as lawn maintenance and construction are regulated by time of day. The Shers have complained about early morning trash pickups. The Philadelphia noise ordinance states that trash cannot be hauled between 9 p.m. and 7 a.m. The Shers have complained about a trash truck emptying nearby dumpsters at 4 a.m. According to the noise code, trash cannot be hauled between 9 p.m. and 7 a.m.
To lodge a noise complaint, Philadelphians can call 311. Noise is less of a concern in the suburbs, though proximity to a highway or train line can be a problem. When searching for a home in January, Bridget Brown knew she wanted to live in Philadelphia’s Queen Village neighborhood, but noise was definitely a consideration. Concerned about traffic sounds from I-95, she avoided Front Street. She also steered clear of streets with a bus route. “I like to have the windows open and wanted to move into a house where that would be possible,” said Brown, 34. To get a sense of a neighborhood’s noise level before you buy, the Seattle-based company HowLoud offers a free tool called Soundscore, which rates locations nationwide based on environmental noise. “Noise is an important part of quality of life,” said Brendan Farrell, who started the company five years ago when road noise prevented him from enjoying his deck. For some people, sounds are a plus.